NASA's Terra and Aqua satellites caught Hurricane Newton's two landfalls in Mexico. 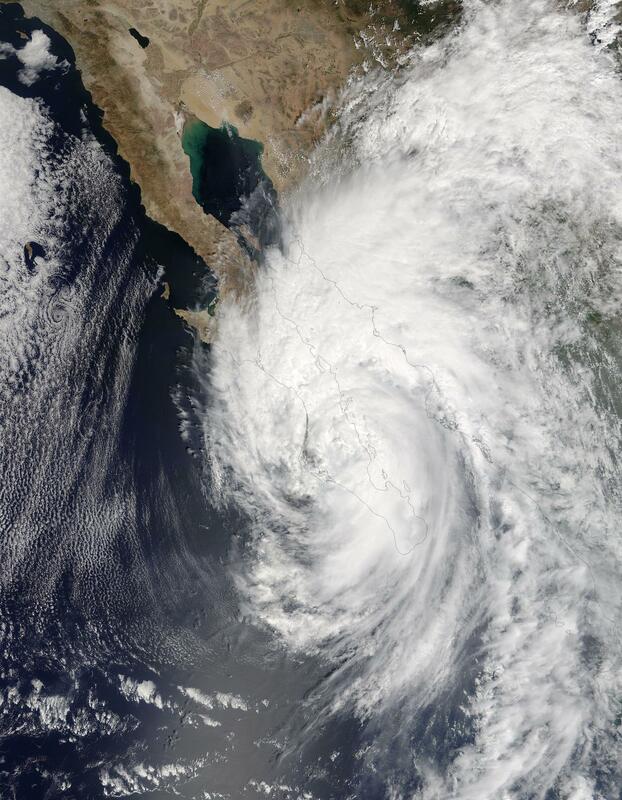 The MODIS or Moderate Resolution Imaging Spectroradiometer instrument aboard NASA's Terra satellite captured a visible image of Hurricane Newton after its center had made landfall in the southern part of Baja California, Mexico. MODIS provided an image of the storm at 2:25 p.m. EDT (18:25 UTC) that showed the cloud-filled center of circulation over the Baja, and the eastern quadrant of the storm extending over the mainland of western Mexico. 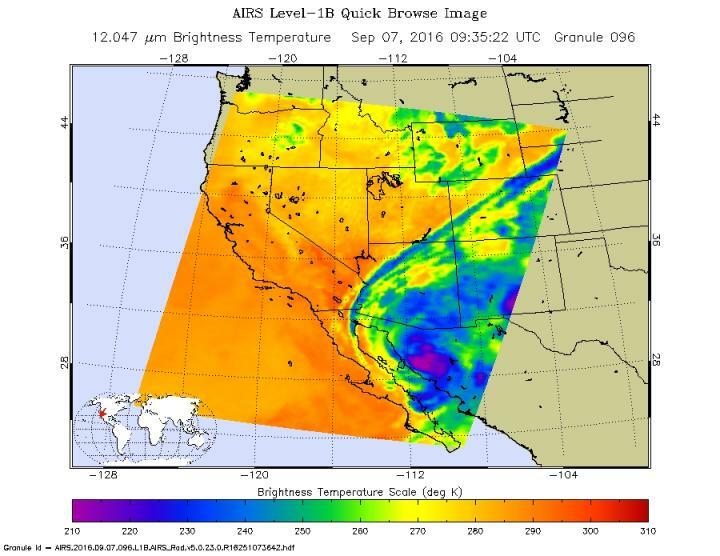 The Atmospheric Infrared Sounder or AIRS instrument that flies aboard NASA's Aqua satellite analyzed Newton in infrared light at Sept. 7 at 5:35 a.m. EDT (935 UTC) after its center had moved onto the mainland of Mexico. Infrared light provides temperature data. Coldest cloud top temperatures exceeded minus 63 degrees Fahrenheit (minus 53 degrees Celsius) around the center. Storms with temperatures that cold are high in the troposphere and NASA research has shown they have the ability to generate heavy rain. By 11 a.m. EDT on Sept. 7 NOAA's National Hurricane Center (NHC) said .Newton continues to weaken over northern Sonora, Mexico and high wind and flash flood watches in effect for portions of southeastern Arizona and southwestern New Mexico. At that time the center of Tropical Storm Newton was located near 30.2 degrees north latitude and 111.3 degrees west longitude. That puts the center of Newton about 80 miles (130 km) north-northwest of Hermosillo, Mexico and about 135 miles (215 km) south of Tucson, Arizona. Newton is moving toward the north-northeast near 18 mph (30 kph), and this motion is expected to continue until Newton dissipates tonight. On the forecast track, the center of Newton will move into southeastern Arizona during the afternoon of Sept. 7. The estimated minimum central pressure is 994 millibars. Maximum sustained winds have decreased to near 50 mph (85 kph) with higher gusts. Continued rapid weakening is forecast, and Newton should weaken to a tropical depression over southeastern Arizona by this evening and dissipate overnight.